For the Love of Chocolate; raw vegan chocolate mousse. 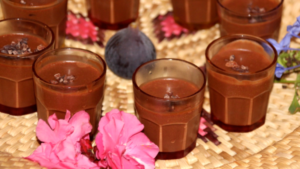 This raw vegan chocolate mousse is simple to make, and BEYOND DELICIOUS! AND it’s made from only good stuff, so you can treat yourself and feel good about yourself all at the same time. Isn’t that how you should always feel? Blend all together until it is smooth and creamy. Put it in the fridge around 30 minutes. Decorate the mousse with fruits, pistachio or coconut shreds. https://www.ibizaretreats.com/wp-content/uploads/2017/02/IMG_8727.png 640 1136 Ibiza Retreats https://ibizaretreats.com/wp-content/uploads/2018/02/ibiza-retreats-trans-300x138.png Ibiza Retreats2017-02-20 17:55:552017-02-21 12:16:32For the Love of Chocolate; raw vegan chocolate mousse.